pushedbutton wrote: Decaffeinated Instant Coffee. Do not drink this stuff and expect a decent mix. The caffeine intake to piss break ratio makes for a very ineffective work flow and you will still be left needing a decent cuppa. And suddenly my relaxing day off is filled with things to revisit and work on. Thanks Selig. Lol this is great info. I'll be rereading it a few times. oh man.. i'm guilty of all this stuff. i'm sure i'll learn one day! EDIT: Question deleted. I've identified the blunder which made the overall volume of my mix very low (bad EQ settings on drums). Good stuff, how do you feel about mixing/mastering with headphones rather than monitors? 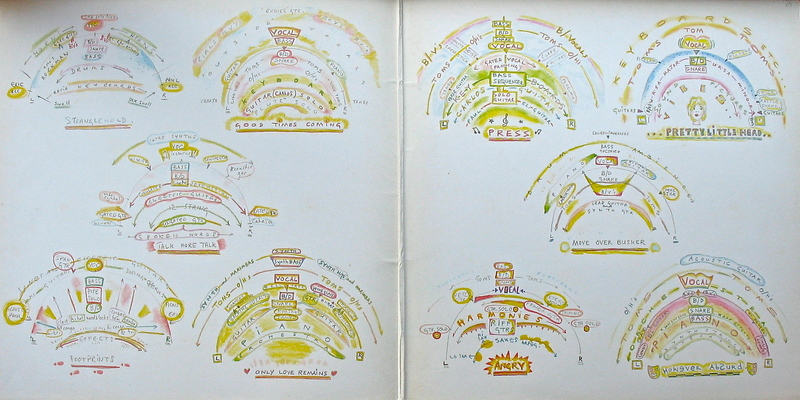 There is an insert illustration from McCartney's 'Press to Play' album showing pre-mix panning ideas. I don't know if this will be helpful with regards to panning suggestions or not but it does present a cool visual. Most of these mix positions in the illustration are accurate on the finished tracks of the album. Not one of McCartney's best albums but it sounds very good. Hopefully you can zoom the attachment. “I always like to start my mixing day by listening to some records I know and love — ideally in the musical style I will be working in — in the seat I will be sitting in to mix, and over the same D/A converter,” says Doell. Along with all the others. Yeah, I could follow up until the point where "D/A converter" was the end of the sentence - what companies brochure was that from? I don’t even think it’s necessary to sit in the same seat or listen to music with the same style. What IS important to me is to listen to music I think sounds good, and sometimes I intentionally listen “ambiently” (not directly) as I’m setting up other parts of the studio. Just a completely random thought out of nowhere. Sometimes a very successful track is made by someone who doesn't have a clue what they're doing. It's important to know when to relax and have fun and not be too concerned with going through a checklist of rules. Be wary of getting overly concerned about what you're 'not allowed' to do. pushedbutton wrote: Just a completely random thought out of nowhere. Indeed this is a truth, though I would argue that the person doesn’t have a “clue”. They typically are very bright folks with many clues as to what sounds good and even a few clues as how to get it. Yes, sometimes a remarkable person comes along and astounds as all with their effortless success. And many others don’t need professional training to achieve professional results. To that specific end I would think this sort of list is actually more aimed at folks like tat than at anyone who is professionally trained or studied, as those with training would likely have little use for a compilation of what has not worked in the past for others. Think of this more as a guide to what has not worked in the past, rather than as a list of rules that DO work. This is helpful not only to avoid common problems but also to give a starting point for how to solve the most common issues you’re likely to encounter. At least for those of use with no access to professional training or without a strong dose of natural talent.